Near the end of the War of 1812, which lasted from June 1812 - February 1815, a little-known battle occurred in the town of Willsboro, NY. Named the Battle of the Boquet River (spelled alternatively as Bouquet), the skirmish was between a British flotilla and the local militia. 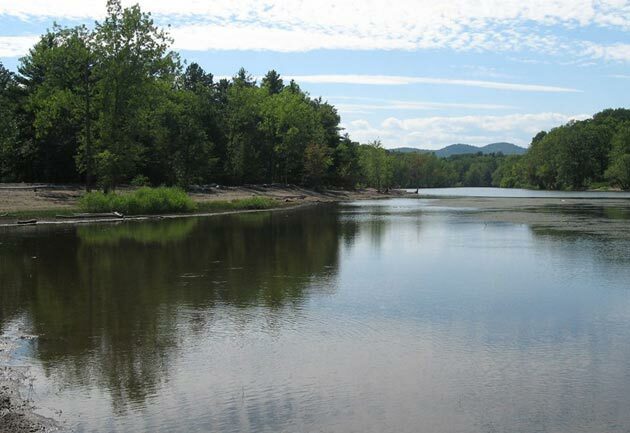 The flotilla sailed up the Boquet River in order to take over Willsboro, but the militia was able to fend off the invasion. Based on different reports, the battle either took place on May 13 or May 14, 1814. While the battle sounds simple enough, there are competing historical accounts. One, a letter by the Brigadier General in Essex, presents a more basic description of the battle. The other, from a Willsboro family record, tells an exciting tale that recalls Paul Revere's famous midnight ride. During the War of 1812, Brigadier General Daniel Wright was the commander of the Essex County militia, which was made up of people from nearby towns. He directed members of the militia and other military leaders as the battle took place and had more of a behind-the-scenes role. However, he did write a letter on May 15, 1814 to New York State Governor Daniel D. Tompkins. In this letter, Wright gave his official report on the battle and the militia's success. The letter begins with a description of the invading British flotilla. A flotilla is a formation of small warships, which in this instance included 17 different ships: a brig with 20 guns, six sloops and schooners, and 10 row-gallies. Brigadier General Wright reported that the flotilla arrived near Boquet River on a Wednesday and lurked around the area until Friday night. The British made anchor off Split Rock, and one of the row-gallies chased a local boat up the Boquet River and raided the farm of Aaron Fairchild, Esq.. On Saturday morning, a group of the row-gallies attacked the fort located at nearby Otter Creek in Vermont, but the ships had to retreat after meeting resistance from Commodore McDonough and his forces. According to Wright, one of his officers, Lt. Col. Nobles, acted in Wright's stead and summoned the Essex County militia in preparation for a greater attack. Wright was away from Willsboro at the time, but word soon reached him about the invading British force. The Battle of the Boquet River began that Saturday afternoon when three of the flotilla's row-gallies sailed up the Boquet River and landed at the town's falls. They demanded control of public property from Willsboro's citizens, but upon learning that the militia was on its way, they left and sailed back toward the river's mouth. In conjunction with Lt. Col. Nobles, Brigadier General Wright planned out an attack on the flotilla as the boats approached the mouth of the Boquet River. The militia crossed through the woods and attacked the row-gallies as they passed down the river, leaving one significantly damaged. Wright noted that one of the flotilla's sloops towed the damaged row-gally away, and then the rest of the British boats retreated from the Boquet River. Wright described this battle as a success and emphasized that all of the militiamen acted like combat veterans. The Battle of the Boquet River resulted in no casualties, and only a few men were wounded. From Wright's perspective, the militia should be praised for their efforts in fending off the British flotilla. After reading Brigadier General Daniel Wright's account, it seems safe to assume the small battle was all about the success of the local militia. However, in a different account, the skirmish takes on elements of a tall tale, with a focus on the role of Willsboro's Higby family. As reported by historian David C. Glenn, the Willsboro Heritage Society posseses the Higby family record, which portrays the family as major players in the battle. From the story told in the family record, Levi Higby, the patriarch of the Higby family, affected the outcome of the Battle of the Boquet River. In Willsboro, Levi Higby owned forges that were used to make American war ship anchors and a distillery to supply American soldiers and seamen with grog (mixed alcoholic beverages). According to this account, the British sailed into Boquet River with an imposing flotilla and silently traveled up toward Willsboro. From the falls area, the British soldiers marched into the town and quickly took control. It's said that Elihu Higby, son of Levi Higby, ran into the distillery and shouted, "Pa! Pa! The Britches is comin! The Britches is comin!" It's interesting to note the similarity to Paul Revere's famous phrase, "The British are coming," at the start of the American Revolution. The story in the family record takes a surprising turn at this point. In a moment of ingenuity, Levi Higby took control of the situation and welcomed the British soldiers. He then offered the soldiers food and the best liquors from his distillery to lure them into a false sense of security. The British were unaware of the approach of the local militia. While the British soldiers were drunk from the strong liquors, the militia arrived and made a surprise attack on them. The soldiers retreated back to the row-gallies and quickly sailed down the Boquet River. The full British flotilla, located at the mouth of the Boquet River, attempted to fight back, but their cannons were unable to reach the milita on the high riverbanks. In the end, the flotilla was forced to retreat. The truth of the Battle of the Boquet River is that there are multiple accounts of the battle, but each one has differences. Local newspapers reported that the battle occurred on two different days, and the Brigadier General and the Higby family record have their own unique perspective of the battle. Unfortunately, for all you history buffs out there, there is no clear answer for what actually happened at The Battle of Boquet River. Perhaps, like many tall tales, there is some truth to the circumstances surrounding the battle, but it's up to you to decide which account to believe.